Former United States president Barack Obama wished Zion Williamson a "speedy recovery" after the top NBA prospect hurt his knee. Teenage sensation Williamson – who is expected to be selected with the number one pick in the NBA Draft – injured his knee in Duke's 88-72 loss to North Carolina on Wednesday. The 18-year-old lasted less than a minute of the game before his Nike sneaker ripped and he fell to the floor, grabbing his leg and not returning after heading to the locker room. Duke head coach Mike Krzyzewski told reporters post-game that Williamson suffered a mild knee sprain but there was no timetable for his return. "We're very concerned about Zion," he said. "It's a mild knee sprain. We will know about length of time tomorrow. It's stable. Obviously it has an impact. You lose the NPOY on the first play." Obama, who was in attendance at Cameron Indoor Stadium, offered his best wishes to Williamson via Twitter. 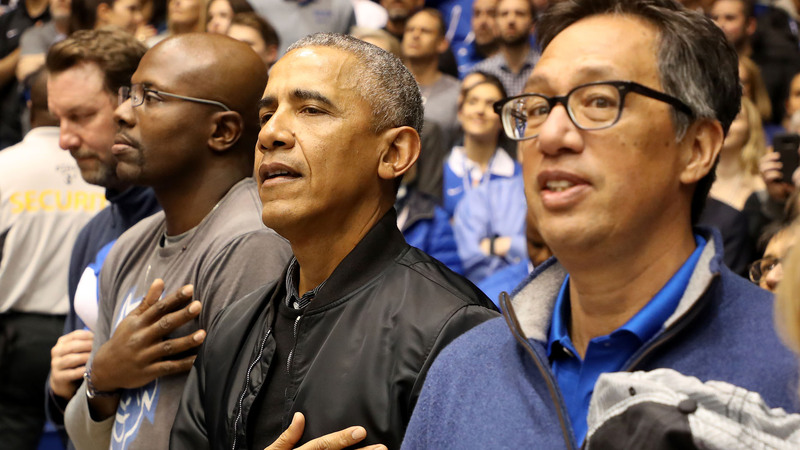 "Zion Williamson seems like an outstanding young man as well as an outstanding basketball player," Obama wrote. "Wishing him a speedy recovery." Los Angeles Lakers superstar LeBron James also used social media to reach out to Williamson. Williamson is a contender for the Naismith College Player of the Year award as he is averaging 22.4 points, 9.2 rebounds and 1.9 blocks in his freshman season.